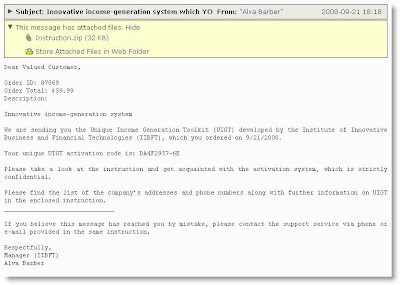 We are sending you the Unique Income Generation Toolkit (UIGT) developed by the Institute of Innovative Business and Financial Technologies (IIBFT), which you ordered on 9/21/2008. Please take a look at the instruction and get acquainted with the activation system, which is strictly confidential. Please find the list of the companys addresses and phone numbers along with further information on UIGT in the enclosed instruction. If you believe this message has reached you by mistake, please contact the support service via phone or e-mail provided in the same instruction.